Special Notes: To ensure passage, boaters must arrive at least 30 minutes prior to closing. Swing bridge located 1 km upstream with clearance of 3.2m (10.4 ft.). Bridge swings on demand. Of Interest: An interesting construction feature here is that the lock is built at the bottom of end of a ravine, a “snie” (dry flood channel) that today forms the navigation way for the Rideau Canal, bypassing the rapids in this location. 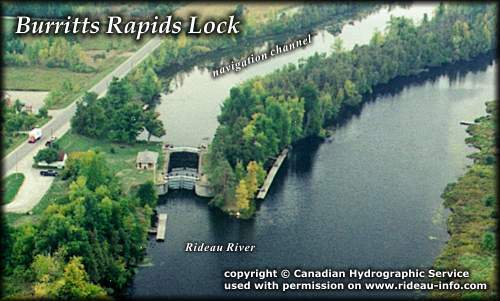 Many Rideau locks took advantage of natural features such as these natural flood channels to both speed up and reduce the cost of canal construction. The water control dam is located at the head of the island, diverting water into this channel. You can walk the entire length of the island on the Tip to Tip Trail (a pleasant 2 hour stroll). It makes for a nice relaxing journey, especially if you stop to take in the historic village of Burritts Rapids. Notes: Gas is available several km downstream at Pirate Cove Marina. Burritts Rapids Lock looking SouthwestThe lock marks the eastern end of the canal channel constructed to bypass the rapids. This is the more "typical" type of canal design, a canal channel bypassing the rapids with a dam placed at the head of the rapids to provide for navigation depth above the lock. At many spots on the Rideau, Colonel By used a "slackwater" design that placed a dam at the bottom of the rapids, raising the water and drowning the rapids. This was often much faster and cheaper than excavating a channel around the rapids. In the case of Burritts, the use of an existing natural flood channel known as Oxford Snie made bypassing the rapids a relatively easy chore.